ABOUT THIS INTERVIEW: The film 'A Hard Day's Night' premiered in London on July 6th. This was followed by the film's Northern premiere in the Beatles' hometown of Liverpool on July 10th at the Odeon Theatre, with the group and their manager Brian Epstein in attendence. 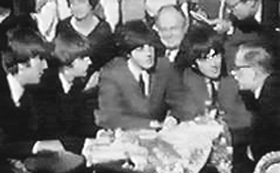 The Beatles were interviewed for BBC-TV by Gerald Harrison during the band's triumphant return to their hometown. In the preceding two months, there had been British press reports stating that the Beatles' Liverpool fans had become disenchanted with them, inferring that it had been too long since the band's most recent public appearance there. One month later, Paul McCartney would state during a press conference in Vancouver: "Before we went to Liverpool last time for the Northern premiere of the film, we'd been down in London a lot because we'd been doing the film and TV and things. And everybody was saying, 'I've just been up to Liverpool and they hate you up there, and it's terrible. Nobody likes you anymore.' And we believed 'em, you know, 'cuz we read the paper same as anyone else. And we went up there, and it was the most ridiculous reception we've had anywhere, you know. So I give-in believing these rumors." In fact, 200,000 Beatle fans filled the streets to cheer the group's hometown return. Following the premiere of their first film, the Beatles would make concert appearances in Britain and Sweden before embarking on their 1964 North American tour in August. The Beatles would return to Liverpool later in the year on November 8th for a hometown concert at Empire Theatre. Q: "What does it feel like to come back to a big civic reception like this?" Q: "Did you ever imagine that this day was coming?" PAUL: "Never like this! I mean, you know-- We used to come here spotting the plane numbers and things." PAUL: "Never imagined, you know, we'd come back to this!" Q: "Well, now you've all made a fortune-- Have you got any future ambition in mind?" JOHN: (jokingly, feeling his pockets) "I haven't got any on me. Oh." Q: "No, no. I don't want to borrow any, John. Have you got any future in mind now? Any other ambitions?" JOHN: "Don't know... like to make more films, I think. We'd all like to do that 'cuz it's good fun, you know. It's hard work, but you can have a good laugh in films." Q: "What about you, Ringo?" RINGO: "Same. I enjoy films." PAUL: "Well I think, you know, all of us want to do, sort of... a good film. One that we all think is good. And make more good records." GEORGE: (jokingly) "Don't you think THIS one's any good, then?" PAUL: (to George) "Well it's OKAY, you know what I mean." JOHN: (giggling) "Not as good as 'James Bond' though, is it." PAUL: "Oh, not as good as James Bond." Q: "You fancy yourselves as actors, then, do you?" GEORGE: "But I mean, we enjoyed making the last film, and especially, the director was great, you see, and it made it much easier for us. None of us rate ourselves as actors, but you know, it's a good laugh and we enjoy doing it. So we'd like to make a couple more." Q: "Jolly good. Now it's about seven months since you were in Liverpool last-- appearing." Q: "Yeah, and some of the fans have been saying that, you know, they feel that you've deserted them. What do you feel about that?" JOHN: "The people that are moaning about us not being here are people that never even came to see us when we were here. You know, we could count on our fingers the original fans we had here, and the ones that really followed us. And most of them gave up being teenagers anyway. They're all sort of settled in and different things. The ones that are moaning probably came to see us about once, or after we'd made records." PAUL: "The only thing is that we've gotta do alot from London, 'cuz alot of the TV shows are down in London, you know. And so, we're forced to do alot down in London. I mean, it's like someone said the other day-- Why doesn't Harry Secombe go to Cardiff? You know, he never does. But no one ever moans about Harry never going... You know what I mean?" JOHN: (jokingly) "Doesn't he go now-- Harry?" PAUL: "He doesn't go back to Cardiff very often. (giggling) Oh no!!"